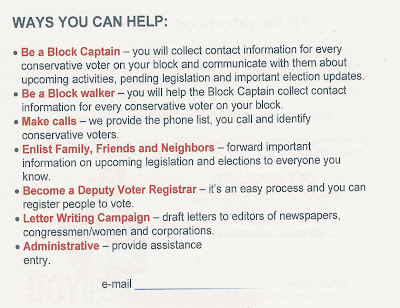 This upcoming election season should prove to be an exciting midterm election partly due to the rise of conservative grassroots groups in the last two years. For the first time in my memory, average American citizens are becoming more politically aware and active. If you've attended any of the Tea Party events, a Congressional Town Hall Meeting or other type of community rallies in the last year and a half, you have seen it for yourself. 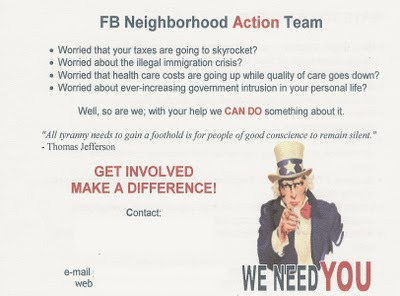 Further proof of this grassroots surge showed up on my parents doorstep last week, when they discovered a postcard on their door inviting them to join a Neighborhood Action Team. 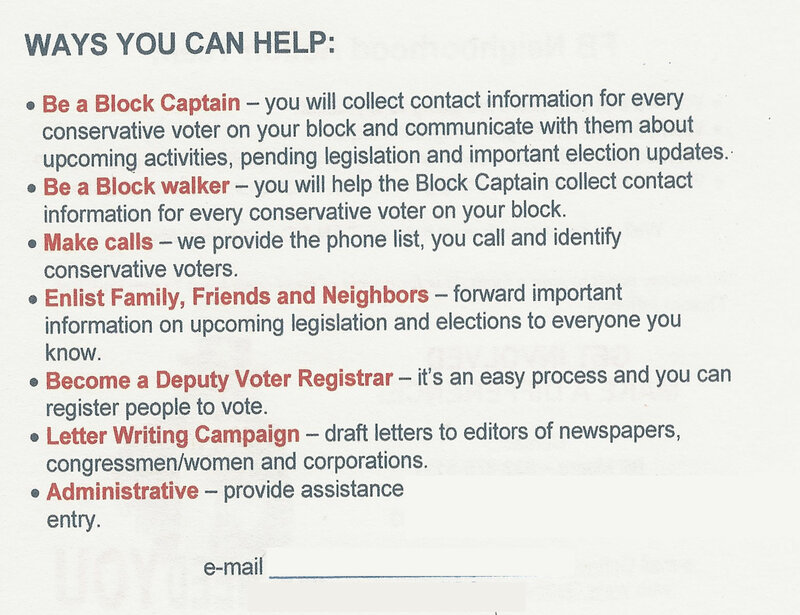 Individuals in their community have established an action group to get people interested in the issues facing Americans this November. *I've removed the personal contact information and website from this postcard. 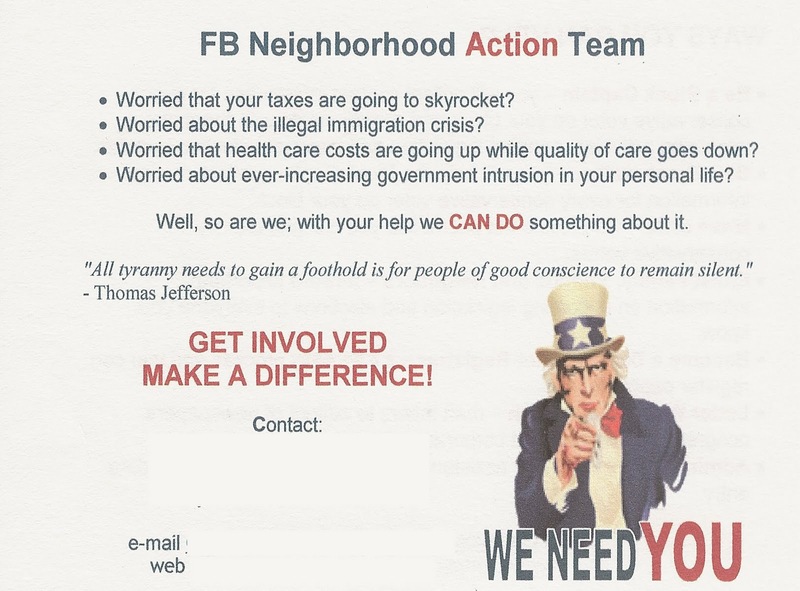 FB is not FaceBook, but their neighborhood. I love the idea of Americans not waiting for the politicians, elected officials or a political party to help them. Instead they are joining friends and neighbors to get informed and involved by organizing and educating themselves. While I haven't seen this type of action in my own neighborhood, I hope these groups are springing up in other cities and states. This first meeting, according to their website, took place at a local coffee house. Though my parents did not attend, you know I'm going to be encouraging them to get involved. If you want to learn more about issues, but are not sure where to start, check back through our Political Archives for discussion and links on issues important to you. Also peruse the links on the right side of our page. It is a great idea to take it upon yourself to get educated on the issues and spread the word to your friends and neighbors. In addition to being our public duty as American citizens, we are also called upon through our faith to be active in our political communities and vote. "Service of the common good requires citizens to fulfill their roles in the life of the political community" (Catechism of the Catholic Church 2239).